Everything in the world is forever changing – our planet, our government, our values, ourselves – everything is shifting. Art serves as a testament leaving its legacy and mark on change. Art provides a reference to our world – a porthole, a window to the past, present and the now. It has always been like this. J M W Turner‘s (b. 1775 – 1851 London) moving watercolour of The Fighting Temeraire shows Nelson’s 98 gun flagship, triumphant in the Battle of Trafalgar 1805 being towed from Sheerness to Rotherhithe to be broken up and used as scrap in 1838 As the new age ushers in new forms of transport, men are no longer slaves to the seas whims: it is the beginning of the age of steam – the ‘floating kettles’ as some called them. The beautiful setting of the sunset shows a sense of loss as the old warship contrasts with the smaller steam-powered tug. ‘As a rule, it is only dead men whose works have risen to such figures,’ declared The Times, ‘and even these honoured dead may be counted on the two hands. However, only £4,500 of this was paid for the painting itself; the rest secured the far more lucrative copyright and sole exhibition rights.” What price artistic ‘progression’ eh. Frith was very well paid for him labours it seems. The third painting is by illustrator Norman Rockwell (b 1894 – 1978 New York USA) ‘Coinoisseur’ 1962 – a tribute to Abstract Expressionist Jackson Pollock (b. 1912 – 1966 USA). 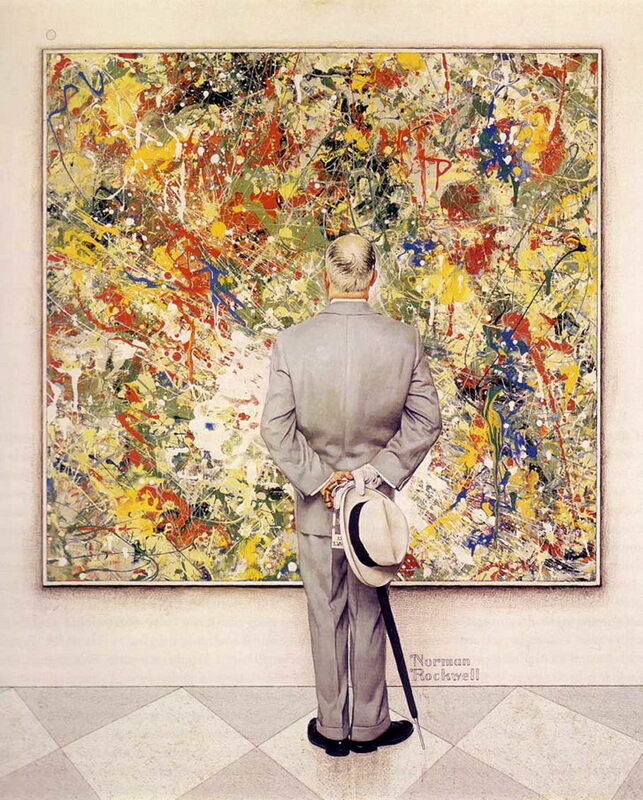 Whilst the painting is sometimes interpreted as a compliment to Pollock – it is also interesting to note the comparison between Rockwell’s illustrative art and the new Modern art of Pollock who was big news in the art scene of 1962. This is the painting which has inspired yet another Poetry Challenge! This time it’s about – you guessed by now – PROGRESS:-) For details of how to enter please click The connoisseur to go over to Bookstains where you will find this and other poetry challenges that are art related. This entry was posted on November 30, 2010 at 4:49 pm and is filed under ART, ART HISTORY with tags Abstractexpressionism, Jacksonpollock, Norman Rockwell, William Powell Frith. You can follow any responses to this entry through the RSS 2.0 feed. You can leave a response, or trackback from your own site. I had not seen the Frith painting! What sheer fun all those stories going on at once. I enlarged that and the Turner (who fascinates me). Thank-you, Lynda, for something new to me. I definitely recognise the fight temeraire. Turner is a fantastic artist. Great choice of paintings – especially the railway scene. I will post my poem about it now and send you the link on Bookstains. very enjoyable post here! O lovely Lynda, what treasures you post. 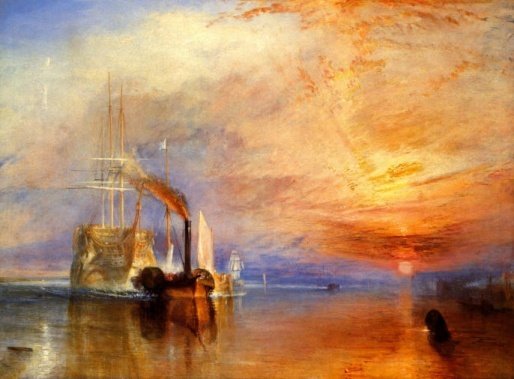 Am another Turner fan–oh his COLORS–! The Railway Station is a glorious delight is realistic details. Great stuff. Am thinking about your poetry challenge–Progress. Oh my. Thanks for your comment on my site today. I loved that adaptation of Bleak House. But I think it was on BBC? Just a couple of days ago I posted a clip from it on my facebook site (not a place I frequent very much these days) – I’m sure it was BBC. I liked Guppy too, played by Burn Gorman (almost sounds like a Dickensian name itself!). It was so sweet and sad watching his love for Esther. He looks so lovelorn naturally. Gillian Anderson was superb, I think she is a wonderful actress. I read some interview with her just recently about a TV series she’d in, but can’t recall right now which. In Bleak House she just had a tremendous presence even without speaking. I loved the ‘dark’ aspects they brought out in that version and the way they cut between scenes with that fast backwards&forwards motion. Dickens would so have approved. Did you see the BBCs version of Oliver a couple of years ago? That was superb too. Tom Hardy was a really scary Sikes! And they cast Nancy as a black woman which worked well, her budgeoning to death was incredibly painful to watch. Rather different from that musical version they show every Christmas! Your right Jessica BBC don’t know why I put ITV :-0 should have looked at the box – plus they’re mostly BBC anyway – though ITV seems to be getting in on the act with Downton Abbey and Cranford etc. Guppy ‘My Angelllllllllllllllllll’ Burn Gorman has such a naturally Dickensian face 🙂 Colin Firth who played Darcy in BBC Pride and Prejudice said that the hardest aspect of playing Darcy was to say nothing! Anderson does this beautifully – and with such sadness. The confessional scene between her and Esther had me weeping. Another fine post! I would love to see that railway painting some day! I know this is not particularly fashionable, but I think Norman Rockwell is a better artist than people may realize. Turner is nearly always wonderful! The issue of sentimentality is an interesting one to me. Although I agree too much “feeling” can make one uncomfortable…how did we get here? I would describe the PreRaphaelites you just featured as being maudlin and sentimental too. In fact, much mainstream 19th century art reads that way to me. Yes, both Pollack and Rockwell can be considered successes…just different branches of the same art tree. Good point Al but the world of Rockwell is a world we can remember – the Pre Raphaaelites is a world of knights maidens and myths (which we can only ‘remember’ from fairytales and Tales of Arthurs Round table, so perhaps this makes them more ‘romantic’.